Glorious fragrant blooms to fil your garden with summer colour. Give your home a sunny, uplifting Mediterranean feel with this breathtaking 60cm tall winter-hardy Oleander. Easy to grow, Oleanders thrive on neglect, surviving hot, dry weather or temperatures as low as -5ºC. Supplied as 60-70cm tall plant, in a 3L pot. Note - we use several varieites of pink and peach, ranging from dark to pale - so the exact colour that you receive may vary. 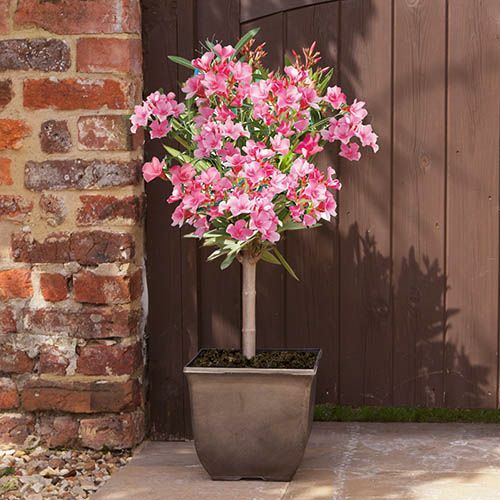 Give your front door, conservatory, patio or balcony a sunny uplifting Mediterranean feel with this breathtaking 60cm tall winter hardy Oleander. Easy to grow, Oleanders thrive on neglect, surviving hot, dry weather or temperatures as low as -5ºC...no wonder it’s one of the UK’s favourite hardy exotics! Gorgeous, sweet scent from its exotic, vibrant pink blooms will gently waft through the warm air in your garden simply delightful in early evenings in the summer. Flowering all summer long, Oleanders are wonderfully exotic, yet incredibly they are UK winter hardy to -5C too. This Mediterranean beauty will add height, vivid colour and sweet fragrance to your garden for years to come! Note - we use several varieites of pink and peach, ranging from dark to pale - so the exact colour you receive may vary. Supplied as a half standard patio tree 60-70cm tall including the 3L pot ready to plant out or re-pot. Best in large pots, in full sun, and can be moved to shelter in winter to help keep it looking at its best. Take care when handling - no need to trim to shape as Oleanders will naturally branch over several years. Pot up using a soil-based compost. Flowering occurs in late summer (July to October) on new shoots of the current season’s growth, so any pruning should be done in late winter or early spring.